At first glance, there doesn’t appear to be much in common between a wonderfully prepared and succulent pork roast and the art of surgical suturing. But two faculty members at West Virginia Northern Community College have collaborated to provide worthwhile learning experiences for students in two wholly different academic programs. 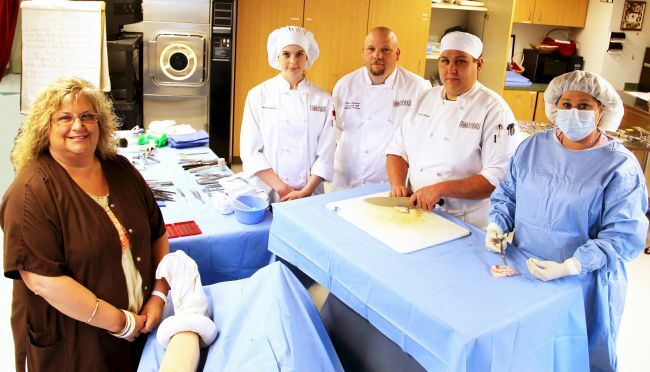 Chef Chris Kefauver, assistant professor of culinary arts at WVNCC, and Bonnie Peterman, instructor and director of Northern’s surgical technology program, conduct their programs in the Education Center building on the downtown Wheeling campus. In the course of a chance meeting earlier in the semester, the pair devised an opportunity for their programs to partner---over a pig. In the conversation with Peterman, the chef mentioned the donation and the two ultimately “began discussing pigskin. Some pig anatomy, bone structure is similar to that of humans and we found parts of the pig that Chris doesn’t need we are using for practice for different mock surgeries,” she said. Peterman said her classes are using “mainly skin, feet and hoofs with tendons. We practice suturing techniques, cutting and tying sutures and stapling. Of course, the parts have to be room temperature but they can be frozen and used for an entire academic year. “Students loved being able to work on suturing techniques with this ‘real’ skin,” Peterman explained, something that’s particularly important to the student. As part of their lab equipment, surgical technician students receive a cloth towel to practice sewing surgically. “Even if we have to pay for it in the future, we intend to retain this as part of what we do in surgical technician training,” Peterman said.